The Cotswold Wildlife Park were delighted to receive the Park’s first Cassowary, a young male. The Cassowary is an impressive member of the flightless ratite family which also contains Ostrich, Emu, Rhea and Kiwis. The Cassowary has been known to attack humans with the odd fatality recorded, due to its huge legs and razor-sharp claws which can inflict serious wounds. Left to its own devices, this shy and secretive bird much prefers disappearing into the forest, rather than confronting an intruder. Cassowary naturally occur in forested areas in New Guinea, Aru Island and in isolated areas of Queensland, Australia. They can also be found on the Indonesian island of Seram where they are thought to have been introduced. They eat a wide variety of food, fruits being the favourite but also plant material, insects, small vertebrates and even carrion. 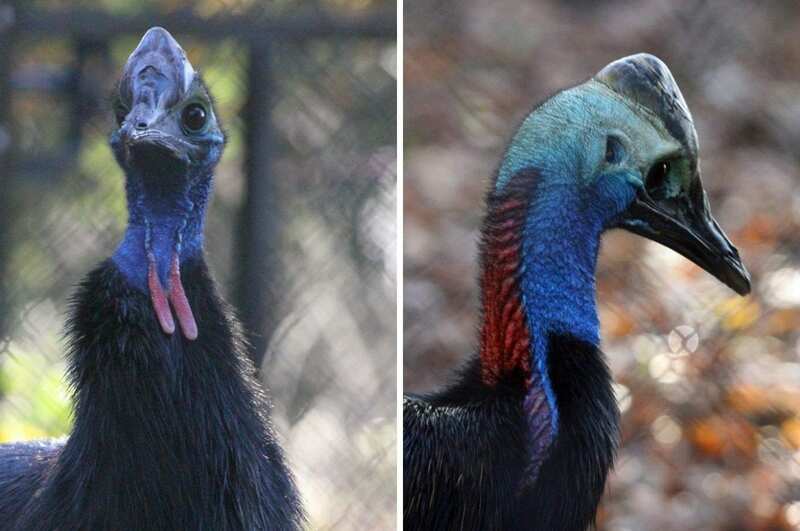 Cassowary are a naturally solitary species, so our young male is quite content on his own in his woodland exhibit. Adults come together only to breed, and the bigger female will then leave the male to incubate the large green eggs and care for the chicks. The Park is waiting for a female to become available from the European studbook for this species and they will be renovating an adjacent exhibit, so they can keep the adults separate until breeding season. They will then introduce the pair and hope for nature to take its course before returning them to their home territories once the male is sitting on the eggs. Fingers crossed that the they will welcome Cassowary chicks to the Cotswold Wildlife Park in the coming years!